Ridge Stone Golf Club was built by the Jim and Dianna Blood family and first opened for business in May of 2002. In 2013, the course came under new ownership led by co-owners John and Shannon Latham and the Sukup family. These new owners set out with a mission to build upon the reputation established by the Bloods: to make Ridge Stone Golf the best maintained course in North Iowa, yet remain playable for people with all abilities from a scratch player to a 30 handicapper. These goals are reflective of those established by the owners of Sheffield Brick and Tile Company, a business established in Sheffield many years prior and originally located on the very grounds in which Ridge Stone Golf Course was built. Sheffield Brick and Tile Co. In 1908, Sheffield Brick and Tile Company purchased 35 acres of land and including a small brick and tile factory from a man named E.P. Fox. Upon settlement of the purchase, the new owners immediately began renovations to modernize the factory including a state of the art 189 X 167 foot building, manufacturing equipment and drying sheds. Eight circular, down-draft kilns, with an inside diameter of 26-feet were built with eight additional kilns added in later years. Situated on a rich bed of clay, this piece of land proved to be the perfect location for this state of the art facility. 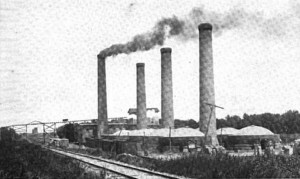 In its early years, the factory employed 55 men, shipped 1,300 rail cars and 750 wagons of brick, drain tile and building blocks to both local and outside customers via the Minneapolis & St. Louis Railroad. Total capital stock included $150,000 which was incredible for the 1908 time period. From that time forward Sheffield Brick and Tile Company would continue to innovate, grow and maintain status as one of the largest employers in the Sheffield community. Years later, Jim and Dianna Blood, owners of Iowa Tile Drainage company in Sheffield, began constructing a golf course on the property. With the help of architect Mark Kerr they built a 9-hole links golf course with the intent to meld the historical remnants of Sheffield’s past, with the rolling hills and tall grass prairies of the North Central Iowa landscape. Today, visitors to Ridge Stone still enjoy those course features reminiscent of the rich history of Sheffield Brick and Tile Company. Ruins of the kilns still stand on hole #4 and provide unique challenges as a “play as it lies” hazard for the hole. We are thankful for the opportunities Sheffield Brick and Tile provided for our community during their time in business, and hope that we too can contribute to the Sheffield community and surrounding areas for years to come.